The Bay Area meteor of Dec. 19, 2018, photographed by David Smoyer from the Nevada side of Lake Tahoe. Lots of people got to admire, and puzzle over, the fireball that blazed up off the coast of Northern California just after sunset on Wednesday (Dec. 19). Folks as far south as Anaheim and as far north as the Oregon city of Medford spotted the meteor or the trail it left behind, according to a sighting map posted by the American Meteor Society (AMS). That trail lingered in the sky for a while — long enough to be twisted by high-altitude winds into a weird corkscrew shape, which caused some folks on Twitter to speculate that it was a contrail left behind by a vehicle of some sort. Though the sun had already set, the meteor trail was high enough up in the sky to still catch some rays. 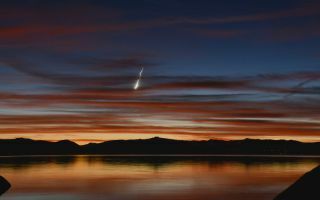 "The sunset was spectacular on its own, but as this brilliant fireball streaked down over the western sky, it lit up, appeared to break into several pieces, and left a glowing debris train that persisted for approximately 20 minutes," Smoyer told Space.com via email. "I've been lucky enough to see a lot of meteors, and lots of bright fireballs, including dozens during the 2001 Leonid meteor storm outburst, but this was the brightest and most impressive I can recall," Smoyer added. "I've been lucky enough to see a lot of meteors, and lots of bright fireballs, including dozens during the 2001 Leonid meteor storm outburst, but this was the brightest and most impressive I can recall," Smoyer told Space.com via email. The fireball trail glowed a gorgeous silvery-white as the sky darkened, because it was high enough up to still catch some rays from the departed sun. Mark O'Lone saw the cloudlike feature from San Rafael, just north of San Francisco. "I was descending our stairs, my arms full of Christmas gifts, when I spotted this unusual sight," he told Space.com via email. Mark O’Lone captured this view of the fireball's trail from San Rafael, just north of San Francisco. "An analysis of the eyewitness accounts indicates that the meteor first became visible at an altitude of 48 miles [77 kilometers] over the Pacific Ocean some 50 miles [80 km] west of the entrance to San Francisco Bay," scientists at the Meteoroid Environment Office at NASA's Marshall Space Flight Center in Huntsville, Alabama, wrote in a blog post Thursday (Dec. 20). Laura Lea Evans snapped this shot of the meteor from Reno, Nevada, on the western slopes of the Sierra Nevada mountains. "Moving west of south at 63,000 mph [101,000 km/h], it managed to survive only a second or so before ablating and breaking apart at an altitude of 34 miles [55 km] above the ocean," they added. Fireballs aren't rare; several thousand of them occur every day around the world, according to the AMS. But most of these dramatic meteors grace skies over the open ocean or thinly peopled tracts of land. And they blaze only briefly, so you have to be pretty lucky even to see one that streaks above your city or town — unless it leaves a long-lingering trail, like Wednesday's fireball did. Editor's note: If you caught an amazing photo of the California fireball that you'd like to share with Space.com and our news partners for a possible story or image gallery, send comments and images in to: spacephotos@space.com.